The official opening ceremony for the newly upgraded Brodick Ferry Terminal will take place on Thursday 12th April 2018. Cabinet Secretary for Finance and the Constitution Derek Mackay MSP will lead the opening ceremony, with Caledonian Maritime Assets Limited (CMAL) chief executive Kevin Hobbs. 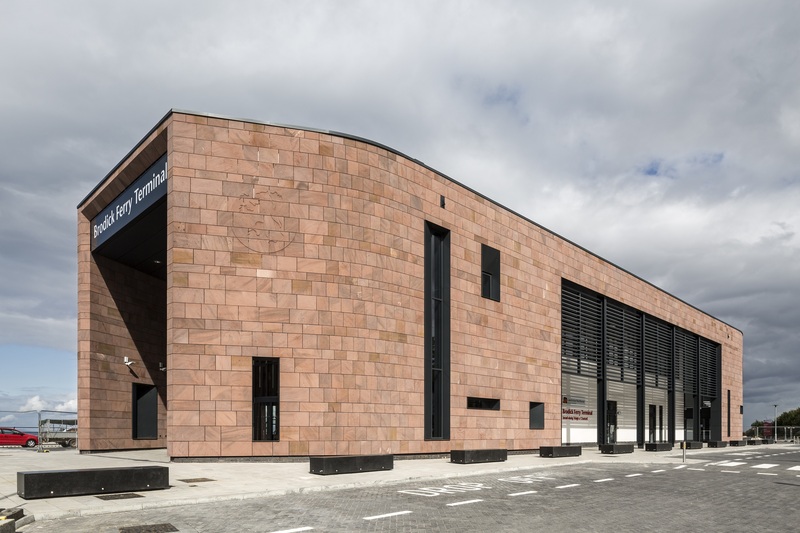 The ceremony will take place at the new terminal building and will begin at 11:10 hours, after the 11:05 hours ferry to Ardrossan departs the terminal. The local community and those with an interest in ferries and harbours are invited to the terminal to attend the opening ceremony. Ferry operations began at the new terminal on Tuesday 20th March 2018 following an extensive redevelopment project. It is the single biggest port infrastructure construction project delivered by CMAL, representing a major investment of around £30 million, led by CMAL, with support from Transport Scotland, North Ayrshire Council, Strathclyde Partnership for Transport and Coastal Communities Fund. Work to transform the harbour began on site in January 2016. The project has delivered a new pier, an increased marshalling area through reclaimed land and a modern terminal building, with bus stances and parking facilities. Media are invited to attend the official opening ceremony of the new Brodick Ferry Terminal.